Who doesn’t like sauerkraut? Okay, I know a few who don’t but its usually because of, well, what I shall call the ‘pucker’ factor. Its is ‘sour’ after all and most store bought kraut is very salty too. But in my quest for the ultimate, who wouldn’t like it sauerkraut I found a way to make ‘sweet’ sauerkraut and you can add whatever meat you want to it too! PLUS you can pressure can it to put up for a delicious meal or snack anytime. And as a bonus, there is no ‘waiting’ around for it to mature. 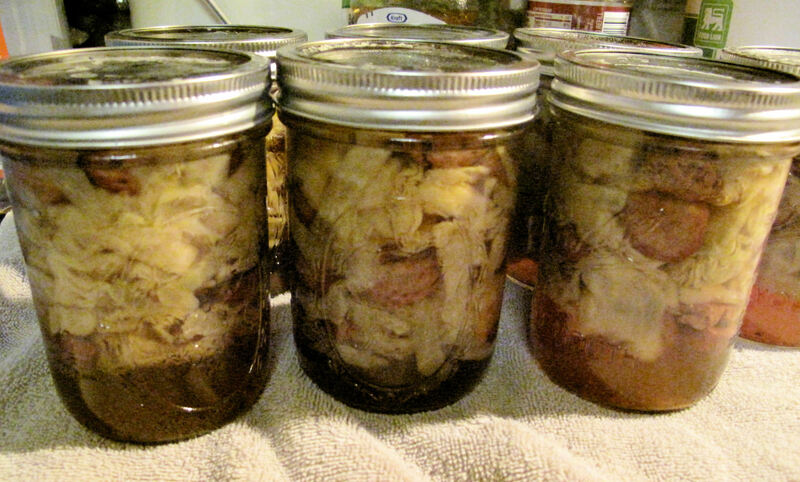 Most canned sauerkraut recipes you either ferment the cabbage before canning it or are told to wait 10 days or more after canning fresh cabbage to get the ‘kraut’. But this, is instant and yummy. The first matter at hand will be to get your canning supplies ready. Following the ‘new’ manufacturer’s directions. Simply run the jars and lids and seals through the dishwasher. Put the jars on cookie pan and place into 250 degree oven. Lids/seals/rings go into a pot of water and are brought right up to a boil and then taken off and put aside. Get your pressure canner water going at this time too. Next you will want to process your fresh cabbage. Peel off the 2 outer most leaves and then wash the outside of the cabbage. Next cut up the cabbage into bite size pieces (however you like, shredded, pieces). Place in a bowl to the side. Cook your meat. 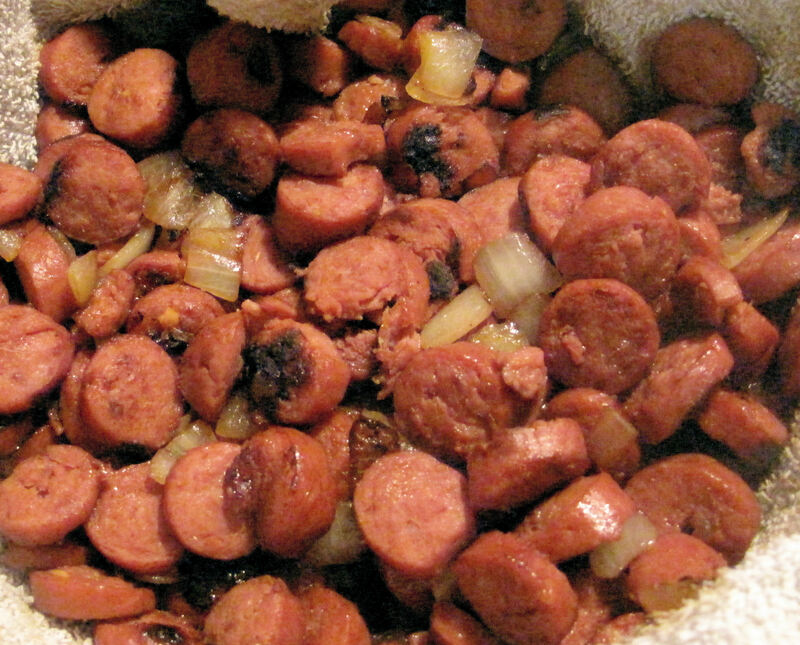 In my case I just browned the sausage in a pan. But how you cook your meat will depend upon what type of meat you use. 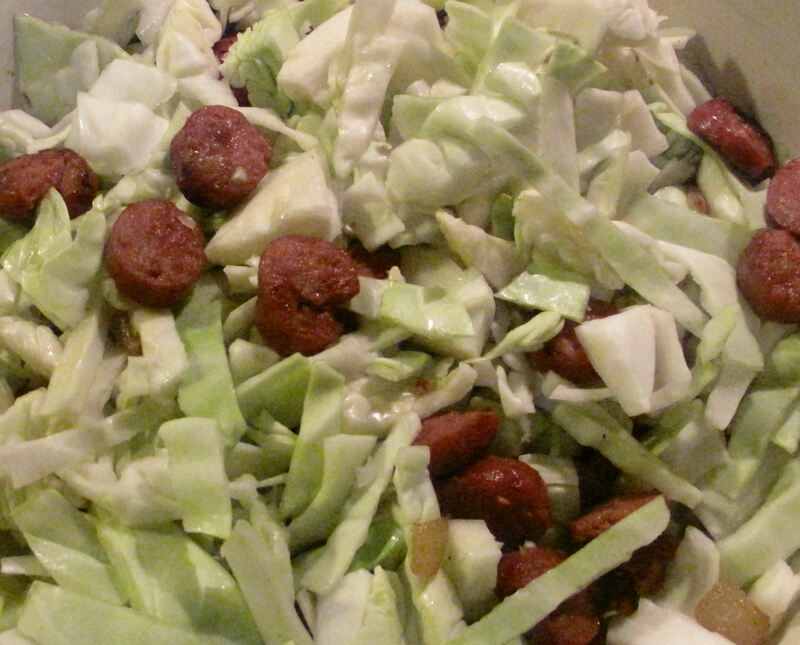 Once you have both the cabbage and meat ready you will then combine into a large bowl and mix well. 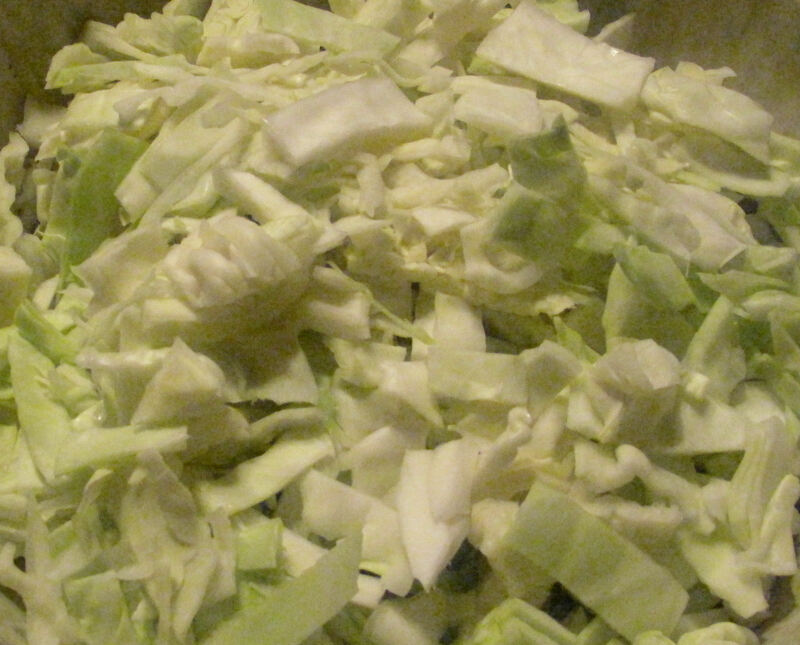 At this point, bring a kettle of water to boil, you will add this to the packed jars of cabbage/meat. 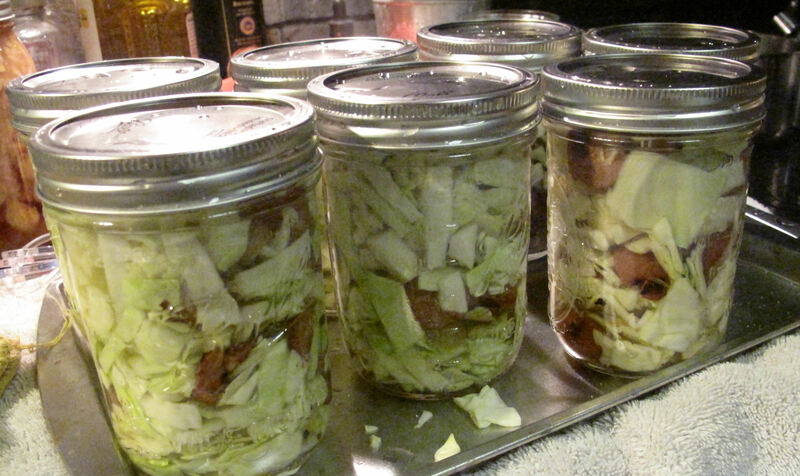 Pack your cabbage/meat mixture into your jars leaving about1 inch head space. If you are using QUARTZ then double the amount of vinegar and sugar. You will then fill each jar with the boil water leaving at least ½ inch of head space. Clean the rim using vinegar and then proceed as you usually would placing lids and rings on each jar. 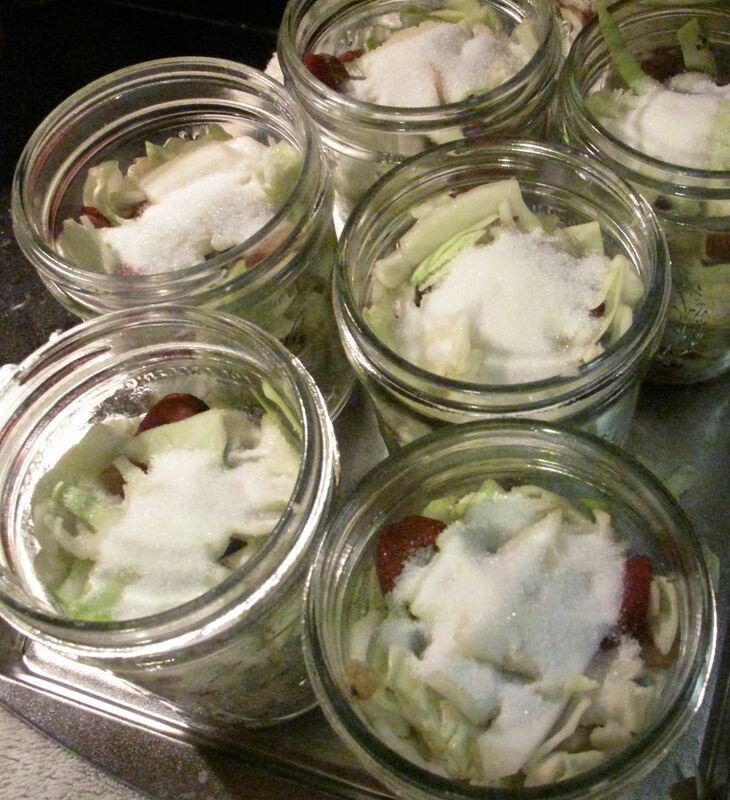 Place the jars into the canner. Allow to come back up to a boil and then process as you would with any normal canning. Pints: 55 minutes at 10 lbs. Quarts: 75 minutes at 10 lbs. After processing you once again follow normal canning procedures. Allow the pressure to come down before removing the top. Place on a towel and cover allowing to cool overnight. Wash the jars before putting up. You can eat at will and its yummy!